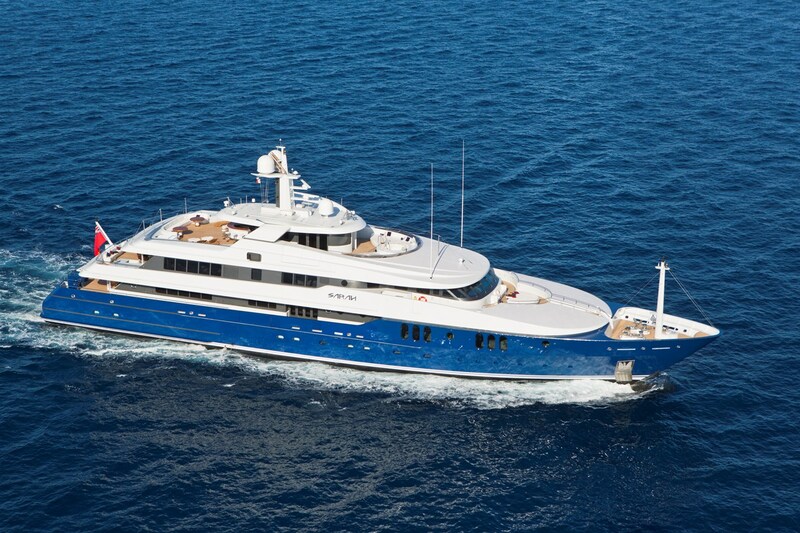 From the prestigious Amels shipyard, motor yacht SARAH was designed by Donald Starkey, with a handsome dark-blue hull and a grand superstructure. At 62m long and 1,370 gross tonnes, SARAH is a very large yacht, with a huge volume available for guest areas. Unusually, SARAH has 9 guest staterooms, thereby offering greater flexibility of sleeping arrangements for charter clientele. These include a full beam master stateroom with super-king bed on the main deck, 4 further queen double staterooms (2 on the main deck and 2 on the upper deck) and 4 twin staterooms (lower deck), all with luxurious en-suite facilities. For those who enjoy the sunshine, guests can sunbathe on the large sundeck, or choose to cool off in the large jacuzzi situated forward. When they have had enough sunshine, they can have a refreshing drink at the bar on the sundeck. The yacht carries a large compliment of 20 crew, further ensuring that guests have the most wonderful experience whilst aboard SARAH.